Tampa action stops local man's deportation | Fight Back! 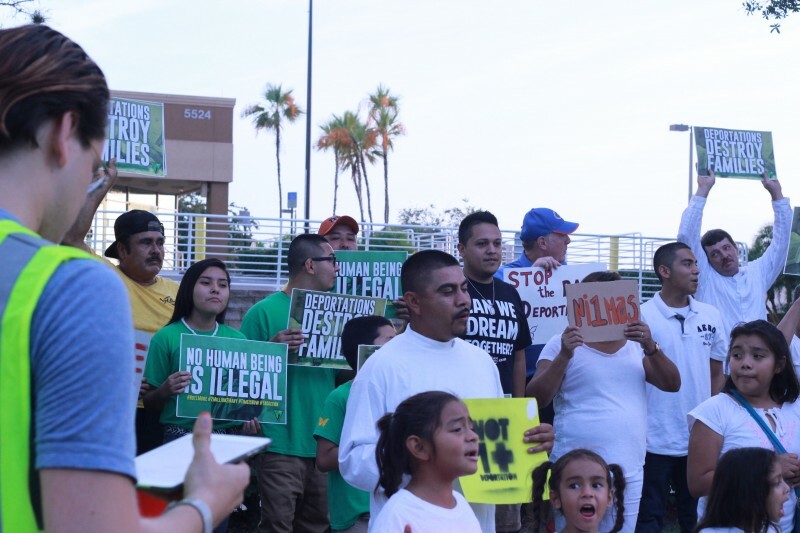 Tampa, FL – A rally by immigrant rights activists on Sept. 25 stopped the planned next-day deportation of David Sanchez. Sanchez, who moved to the U.S. from Mexico when he was 14, was fighting to stay in Florida where he works and has a family. The community rallied outside of a Department of Homeland Security (DHS) office in Tampa. Sanchez was ordered to wear an ankle monitor so that Immigration and Customs Enforcement (ICE) could track his every move. He filed for an extension of his work visa, but was denied. Local groups called for action against ICE and DHS to stop Sanchez's deportation. Over 200 people from around the country called the local Tampa ICE office demanding a stop to the deportation. Later that day, 70 people rallied outside the DHS office with Sanchez's family, chanting "Not one more!" Yadalis Sanchez, David Sanchez’s daughter, said, "It is not fair that ICE can tear apart a family." Marisol Marquez, spokesperson for immigrant rights group Raices en Tampa, said, "Today, we've had enough. Tampa won't forget. No politician was here to help David Sanchez and his family. The people who are here today are the ones really supporting people like David Sanchez. We know the immigration system is doing exactly what it is meant to do - to separate us and hold us down." David Sanchez announced during the protest that ICE had sent him an e-mail regarding his deportation. It stated that ICE was giving him a three to six month extension on his visa. Isabel Sousa-Rodriguez of the Florida Immigrant Coalition said, "Even with an extension, we don't want another deportation tomorrow. We don't want one next week, next month, or next year! No more!" Protesters continued to rally, chanting, "When we fight, we win!" and "El pueblo unido jamas sera vencido!" or "The people united can never be defeated!" Groups that helped organized efforts to support Sanchez included Raices En Tampa, Florida Immigrant Coalition, Young American Dreamers, and United We Dream. The actions on Sept. 25 temporarily stopped Sanchez from being deported. The struggle continues against other deportations, and the people understand that this fight is not over. Marisol Marquez explained, "Obama deports 1100 people like David Sanchez each day. That's why we're planning on protesting him and his 'Deportation Party' on Election Day, to demand a stop to all deportations. 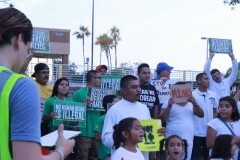 We need Deferred Action for All and legalization for all 11 million undocumented in the U.S."